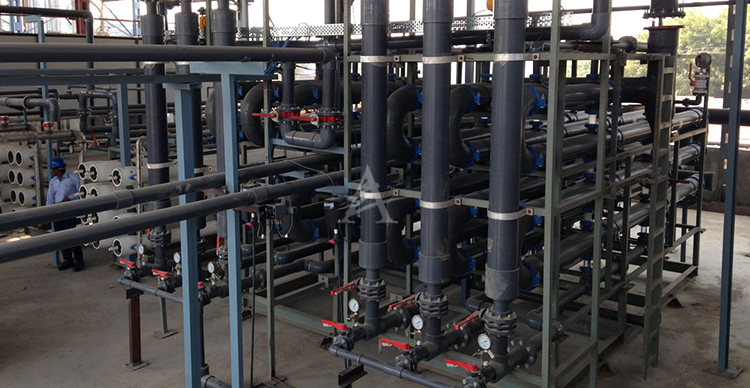 Tubular Membrane Filtration is a highly specialized membrane treatment process with niche applications such as in removal of emulsions including emulsified oil, removal of heavy metals, reduction of calcium and magnesium hardness, reduction of dissolved silica, etc. Unlike any other microfiltration or ultrafiltration configurations, TMF systems are not limited by concentrations of TSS and Turbidity that can be fed to the system and in fact, the system requires circulation of 3-5% slurry through the tubular membranes. Re-circulation of slurry through the tubes help to keep the membrane surface clean by continuous scouring, thereby preventing fouling of membrane. In recycling applications, TMF is a single step process that replaces flocculation, clarification, media filtration and ultra-filtration with higher dependability. It is a robust system that can deal with poor feed quality and inappropriate operations as most often the original performance can be restored by chemical cleaning. ADVENT has supplied India’s largest TMF system, one that might be among the world’s top largest such systems.